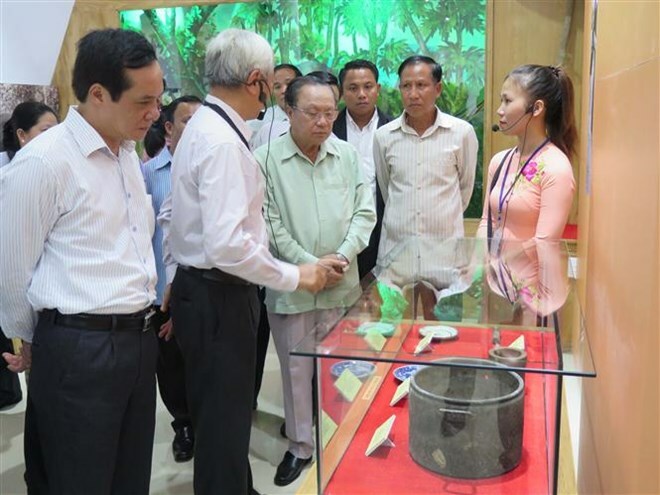 Quang Nam (VNA) – A delegation of the Lao Front for National Construction (LFNC) Central Committee paid an experience exchange visit to the Vietnam Fatherland Front (VFF) Committee of central Quang Nam province on August 30. The visit was an activity within a short-term training course for officials of LFNC held by VFF Central Committee in Da Nang city from August 20 to September 6. Speaking at the event, Hung briefed guests on performance of the provincial front over the past years, saying the organisation has well represented legitimate rights and benefits of people. Quang Nam province’s VFF Committee will continue sharing experience in front work with the Front of Se Kong province of Laos, thus tightening relations between the two localities, contributing to the traditional friendship and special solidarity between Vietnam and Laos, he noted. For his part, Som Ock Kingsada, Vice President of the LFNC and head of the delegation, thanked the VFF Central Committee and Quang Nam province for organising the training course for Lao front officials. He also noted that people residing in border areas between the two countries have been effectively organising exchange activities, contributing to preserving and developing their close relations.